As I attempt to describe in the below figure, there are a few types of BI that are currently available from BI vendors. Historically, most BI deployments began with pure reporting that delivered information to those who needed it for making decisions. Those reports were either printed or delivered electronically via email or a portal. From that basic reporting arose a requirement to either see more high-level, graphical information (e.g., dashboards) or a requirement to have more interactive reporting. Over time, the deployment eventually builds up to where the implementation and the users are mature enough to need analysis capabilities. Of course, today, users are more mature with regards to locating information, manipulating that information, and telling a story with it. 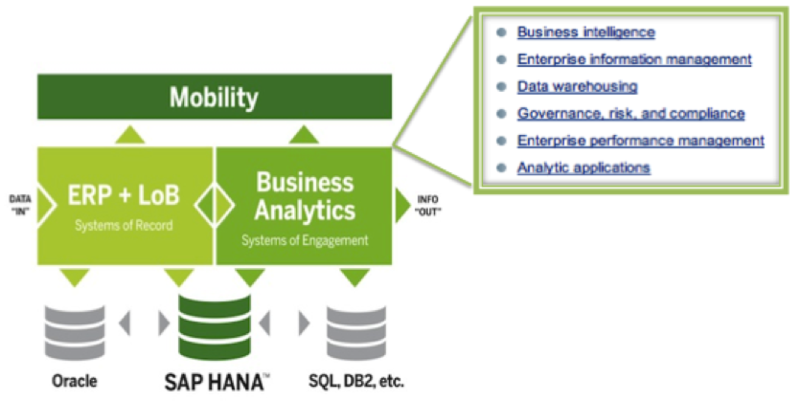 As such, more and more BI deployments are starting with analysis. All of these different types of BI can either be accessed in a standalone mode or embedded. With SAP BusinessObjects, standalone can mean either via a desktop application, BI LaunchPad, or one of the various mobile applications that exist. From an embedded standpoint, you could imagine information being delivered via an internal portal (e.g., SharePoint) or within another vendor’s application (e.g., Sage CRM). For SAP Crystal Reports, and other reporting tools, this has been a cornerstone for engaging partners and proliferating BI content. When you think of reporting, you would typically envision something like operational reports. These are reports that contain specific details about an entity and are directly responsible for supporting business processes. For example, if you were a support representative and were helping a customer on the phone, you might want to see a list of all orders that the customer has placed over the past 12 months. 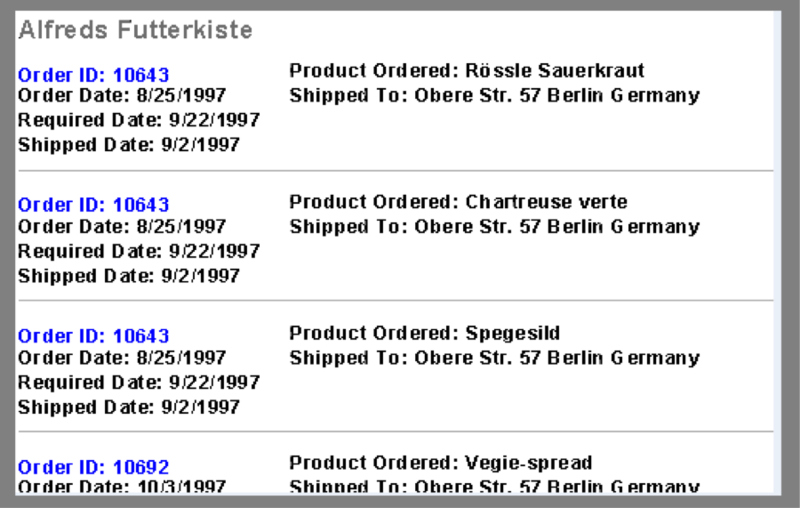 An operational report, such as the one below, would be one way to display this information. In addition, operational reports are usually embedded directly within other applications. 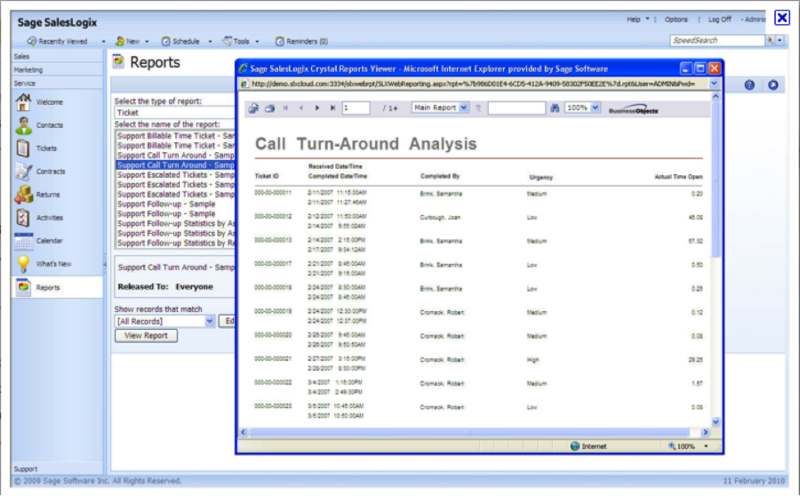 In the above example, the reports for support representatives could be embedded directly within a CRM application. This would allow the individual on the phone with the customer to click a button or a link and quickly bring up the information that they need to reference. In this scenario, the data is either contained within a database behind the CRM application or is generated by the application. In either case, the data is then pushed into the embedded report while the application is running so that the support representative can get what they need in real time. 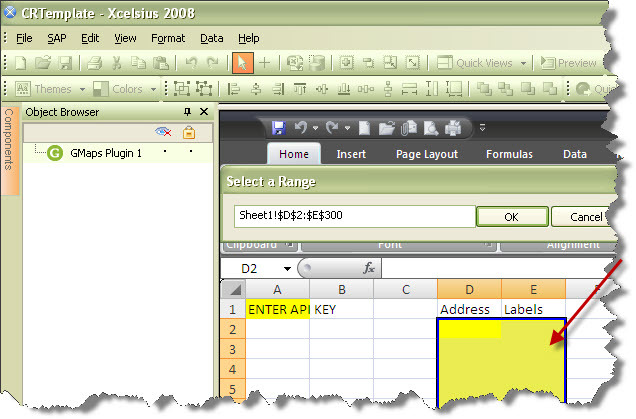 The figure below shows an example of an application, Sage SalesLogix, which currently embeds Crystal Reports content. In this workflow, a user has searched or browsed a list of available reports in order to find the one that is relevant for them. In any case, the important bit is that Sage did not need to develop a report component on their own. They were able to take something, Crystal Reports, which was already built and embed it. The benefit to their customers is that they have a well known reporting solution built in, they can create their own reports using Crystal Reports, and can more easily upgrade their reporting solution by leveraging the SAP BusinessObjects suite to deliver other types of BI content. 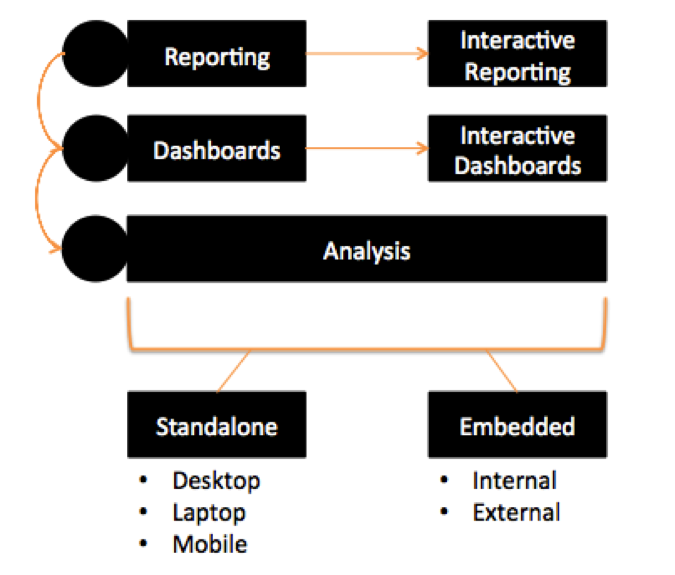 The widespread embedding of Crystal Reports, and other reporting solutions, into other software begs the question of how we (as a general BI ecosystem) can leverage all of this experience of embedding reporting so that we can make it easier to embed BI as a whole. There are examples out there today where interactive BI content and analytics are being embedded; however, this is an area of growth for BI. What examples do you know of where this is being done today? How can BI software vendors make this easier? 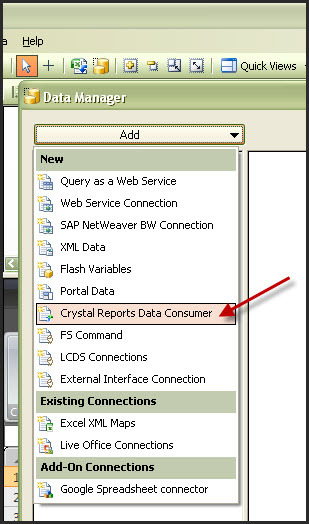 Enterprise Reporting: How does Crystal Reports fit in and where is it going? Crystal Reports began in 1988 under the name of Quik Reports DOS. It was created out of necessity, as the original developers needed a better tool for generating views of the data contained within their accounting application. Through the years, the product has been integrated into many applications and development environments, but has remained a product focused on creating and distributing quality formatted reports that can be created on top of almost any data source. With the latest mainstream version of SAP Crystal Reports 2008, this remains true. The product itself is commonly identified as a Business Intelligence tool; however, it is also referred to as a product for Enterprise Reporting, Operational Reporting, or Business Intelligence Reporting. Regardless of the classification, many market analysts consider reporting to be a key component of any Business Intelligence product suite. 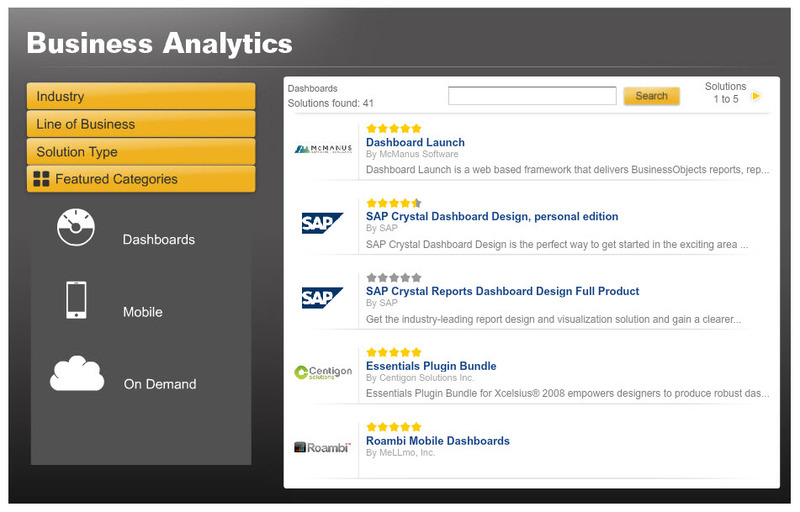 At SAP, it is classified under the Business Analytics suite of products. Who are some of the key competitors for Crystal Reports? With all of these competitors, plus many others that I have not mentioned, the struggle is to differentiate while maintaining true to the vision of creating strongly typed, interactive reports on top of any data source and allowing those reports to be distributed to users in their own environment. We don’t want to create an analysis tool. We don’t want to create a tool for the average user to start creating reports. SAP BusinessObjects provides other tools for that purpose. We want to be the tool used to create beautiful reports on top of the amalgamation of any data sources you can throw at it. Through the years, we have found ways to create interest around the product. We’ve been an embedded report designer in many development environments: Visual Basic, Visual Studio, Eclipse, Borland, and Rational. We’ve created features that allow for accessing newer data sources like XML and web services. 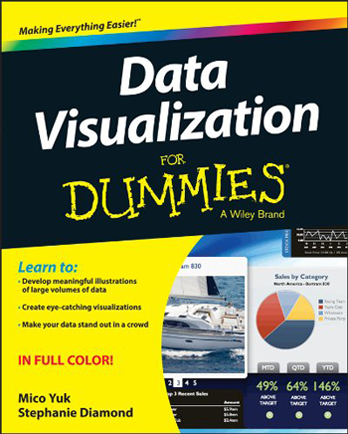 We’ve provided ways to embed more engaging visualizations via the embedding of Flash objects. We’ve also provided more interactive features for the report consumer – without stepping too far into the realm of creating a pure analysis tool. We have our fans and we have our haters. Most people like our ability to create strongly typed reports, the fact that we connect to many different types of data, and the interactive features that we provide for report consumers. Some people struggle with using an outdated report design UI and with embedding reports into their own applications via our APIs. We have a plan for addressing those concerns and delighting our already ecstatic users. Starting with SAP BusinessObjects BI 4.0, we introduced a new report design tool that is currently called SAP Crystal Reports for Enterprise. Over the next few years, you will see this become the primary report design tool that customers use; however, this will take some time. Not only do we need to close gaps between the mainstream version of crystal and the new version, but we also need to get customers onto the BI 4.0 platform before they can start using the product. For now, I’d like to share with you a quick summary of the posts you will see over the next few weeks. I plan to write a four part series that will focus on the types of reports that typically created with products like SAP Crystal Reports and how you can go about creating them. The four types of reports that will be covered are: Operational Reports, Short-Term Strategic Reports, Long-Term Strategic Reports, and Forms. Each of these has their place and purpose in a Business Intelligence deployment. Welcome to the first of many posts on Everything Xcelsius that will cover Crystal Reports. The goal for this post is to introduce myself and explain the series of posts that you will be seeing over the coming months. So let’s get straight to the first of these topics. 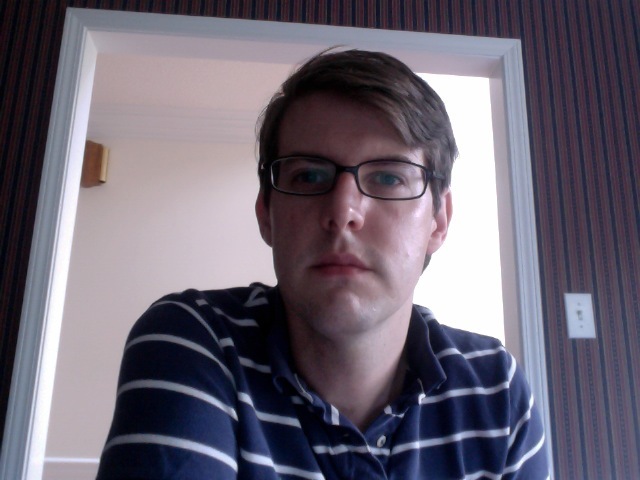 My name is Coy Yonce and I’m one of the Product Owners who work on the Crystal Reports product. If you are not familiar with the agile approach to product development, then you may not be familiar with the role of a Product Owner. In essence, I’m a Product Manager and I help create the backlog of features that the development will be building from one release to the next. My role as Product Owner is a bit different from the role of the other Product Owners on the Crystal Reports team. In all, there are seven of us. The other six work directly with a team of developers and guide those developers during the building of features. My role is that of an outbound Product Owner. I focus on leading conversations with customers and partners so that we have an understanding of what they want to see us include in upcoming versions of the product. As such, I am fairly active on Twitter, blog every so often, conduct surveys, co-host influence council meetings, write articles, interact on forum posts, and monitor ideas on SAP IdeaPlace. I’m sure that there are a few other things as well, but that’s most of it. Over the next few months, you will see several posts from me. They will be organized into a series of posts on somewhat tactical topics. I have provided an brief overview of the series below. I have listed them in the order that I plan to write; however, I may get a bit sidetracked as I encounter an interesting topic or discussion. This will likely be a single post and will provide an overview of Enterprise Reporting, the market, and how Crystal Reports fits in. More than likely, this will be delivered over four posts with each covering a major category of report types that are typically created using Crystal Reports. Again, probably a series of numerous posts with each discussing a category of features that are used together for creating reports in Crystal Reports. This series will focus on designing effective reports. Specifically, it will demonstrate how to create reports that follow information design best practices. Crystal Reports currently has over 50 available connections available. This series will focus on not only the types of data available for creating reports, but specific considerations for building reports against some of those data sources. Once you’ve created your reports, you need to distribute them. This series will focus on the methods available for delivering your reports. Crystal Reports has a very large ecosystem of developers from OEM partners and ISVs. Much of what they do is embed pre-built reports into their applications or generate reports at runtime based on data from their applications. This series will focus on how to embed Crystal Reports and leverage your application data. As you can see the topics are quite broad and will encompass a significant number of posts. As mentioned above, I will attempt to cover these topics in order; however, I may need to skip around a bit to cover a set of related topics properly. In any case, I look forward to blogging on Everything Xcelsius and would like to thank Mico and Soo for the opportunity to interact with such a diverse audience. Coy Yonce is a Crystal Reports Product Owner at SAP and has worked in Business Intelligence for over 10 years. His main focus is leading conversations with customers and partners and is very active in the BI community. You may reach out to him directly via email at coy.yonce@sap.com or follow him on twitter: @coyyonce. For those of you who have looked to the “Get More Add-Ons” link inside of Xcelsius, you may have noticed that there are no longer add-ons available. Over the last year, it looks like SAP has been slowly de-commissioning the On-Demand community site to emphasize other communities. While we are sad to see it go, I assume that this link will soon point to another location; hopefully somewhere like Ecohub. There are some realities when it comes to the Xcelsius marketplace and the SDK. The original vision to foster a marketplace for developers to contribute components never took off for many good reasons. The iStore model only works when there is a critical mass around a platform, a marketplace large enough to support commerce, and a dedicated effort to support and evolve the SDK. Instead, we have small but dedicated group of individuals and software solution providers who currently offer powerful complimentary solutions for SAP BusinessObjects Dashboards and Xcelsius. I have been fortunate to see many of them in action over the years and believe that the On-Demand store did not provide visibility to these great solutions. So where do we go now for SAP BusinessObjects Dashboards and Xcelsius add-on solutions? If your organization is deploying enterprise dashboards inside of BusinessObiects using SAP BusinessObjects Dashboards, the first place you can look is SAP Ecohub . This website features certified solutions not only for SAP BusinessObjects Dashboards and Xcelsius, but also other SAP enterprise applications. The second place, and probably most important are vendor web sites and blogs that provide the level of detail and support that you would require to ultimately make a decision to use or purchase an third party solution. 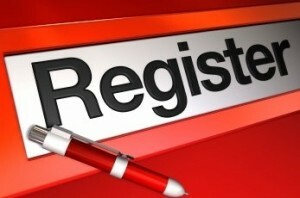 A third place to find information about add on solutions for Xcelsius is at EverythingXcelsius.com “Resources” page. I invite anyone who creates a plugin or complimentary software solutions specifically designed for SAP BusinessObejcts Dashboards or Xcelsius to comment on this post. Perhaps from this, we can generate a permanent list of vendors and products here on EverythingXcelsius. Hopefully this move will give customers access to certified solutions, and a good venue to host a more complete list of add-ons here to give everyone out there visibility to what is available. Xcelsius does not have a built-in feature that allows the storage of local data, a commonly requested piece of functionality. Up until very recently there has been no really easy way to accomplish it with simple client tools, and one way or another it required jumping through several hoops. Fortunately, HTML 5 brings us a feature called localStorage, which allows HTML pages to store data locally across browser sessions and after the closing of the browser window. This is one of many capabilities that HTML5 brings to the table, transforming the browser into a tool with much more potential for serving up fast, more powerful and lightweight applications. Webinar Alert: Fast-Tracking your BI Career One Dashboard at a Time! With all the new BI trends and themes evolving today, how do you keep your career on track? We are excited to announce a free webinar, hosted by Xcelsius Guru and SAP Mentor, Mico Yuk and a surprise guest, that will provide a first hand look at key trends and themes within the BI industry and insight on how to take your career to the next level. We encourage anyone looking to get their BI career on track and to the next level to register today, as seats are limited. We look forward to this very exciting webinar! Soo Tang Yuk fosters and evangelizes the ‘Xcelsius Gurus Network” and its communities. To find out more about her, please visit the About Us page. As usual, before getting started I want to provide a quick recap of where we are with the Reportapalooza competition. This is the last week of voting before the final winner is announced on Nov 22th! Challenge #5 (In Progress) – What this series of blog post is about. Community Dashboard Challenge (In Progress) – Vote until Nov 12th, 2010 for your favorite community dashboard. In Part 1 of this series I went over some Q&A on what it would take to embed your Xcelsius visualization (in this case a map) into your Crystal Report, as well as some pros and cons. In Part 2 I am going to cover how to set up your map in Xcelsius so that it can be consumed by Crystal Reports. For this example we will be using Google Maps (compliments of Centigon Solutions) as it much more robust than the out of box maps in Xcelsius. 5 Simple Step to getting your Xcelsius (aka #SCDD) model ready! In Part 3 I will focus on the final step: Bringing your Xcelsius Map into Crystal Reports. One last thing, please don’t forget to cast your votes on the 3 dashboards that were submitted by the community to show your support. Challenge #5 (In Progress) – What this series of blog post is about! Community Dashboard Challenge (In Progress) – You can submit your dashboard by 11/5 to win a very COOL prize! Unfortunately, I fell a bit behind while attending 2 SAP Conferences back to back this month. Sorry if I let anyone down but I can’t tell you how much I appreciate the support. I also want to give a huge CONGRATS to our current leader David Deitch who is an Xcelsius beginner turned Guru in this competition! So let’s get started with a few simple questions? Q. How can you integrate Xcelsius flash files into your Crystal Reports? Q. What are the Pros and Cons? A. Pros – It is no secret that Xcelsius’ ability to handle large amounts of data is VERY limited. By embedding your Xcelsius flash file into Crystal Reports you get to leverage the power of the Crystal engine while utilizing the beautiful graphics in Xcelsius. It’s like having the best of both worlds. In fact, in my next blog posts I am going to show how to integrate a map in Xcelsius into a Crystal Report. One more thing! This is your last week to submit your dashboards to the community Reportapalooza competition. Hope you read this far down, because if you have something worth seeing I am opening the door to review any entries that you send via email to gurus at everythingxcelsius.com and provide feedback if sent by 10/31 @ 12am EST. Happy New Year to all! 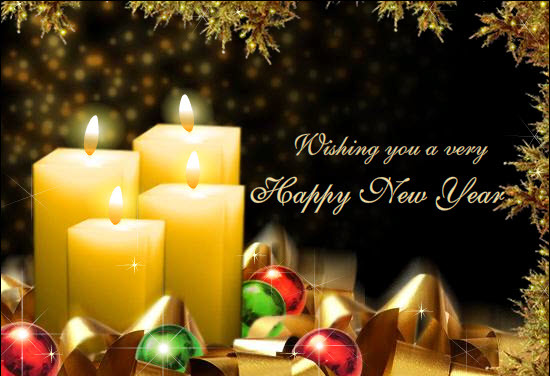 We wish you and your families, Prosperity, Health, and Unlimited Happiness for this New Year! !